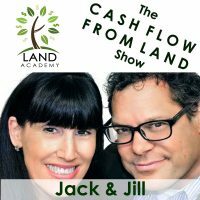 Jack Butala: Welcome to the show today, in this episode Jill and I talk about land investing. Is it passive income, or not? Let’s get to the bottom of that today. Before we get into to it, let’s take a question posted by one of our members on the www.landinvestors.com online community. It’s free. Jill DeWit: Okay, Jason asked, “I’m talking with a man who owns a 3,015 acre ranch in Edwards County, Texas. Land in this area is listed for $1650 per acre.” Whoa-ho-ho-ho, these are big numbers, I like these. Jack Butala: That’s really good. Jack Butala: These are great deals. I love these kind of deals. These are the things that, at this point in our career, Jill and I look for all the time. 3000 acres cut up into 5 APNs is a great situation to be in, especially if they are all contiguous, because you’re either gonna find who wants to buy it all … You’re doubling your chances of selling this property if it’s all cut up. Find somebody who wants to buy it all or maybe find somebody who wants to buy just one of the sections. A section technically is 640 acres or one mile by one mile and we’re gonna assume that it’s got pretty good access. In fact, I’m sure, well I’m not sure but, it’s be hard to go 3000 acres without finding a county road somewhere. Jill DeWit: I’m doing the math. It’s a million, by the way, each of these. Jack Butala: Yeah, so, the price per acres really widely vary based on size. So when you say an acre goes for $1650, I bet it’s not the same price for one acre, five acres, twenty acres, six hundred and forty acres, or three thousand acres. In general, the larger the property the cheaper the price per acre which is what you want. Jack Butala: That works in our favor. You want to get a low price per acre buying a lot of property and then subdivide it or split it down. Jill DeWit: Mm-hmm (affirmative)- And sell it for more. Jack Butala: It’s called the case to bottle method, you know? If you buy a case of beer and it’s, for sake of argument, it’s $24. $24 in a case and you sell them for $3 a beer you’re tripling your money and that’s the same idea here. You need to talk to an expert about this, because you don’t want to make a mistake. The real money and if this is in an unincorporated area, which I bet it is in this county, Texas state law governs that you can subdivide it. You might have to jump through some county hoops, but I’m telling ya, people retire on one deal like this. If you buy it for $300 and acre and sell it for $5000 and acre when you’ve got it all split down and there’s roads to every property and stuff, that’s millions and millions and millions of dollars. You could spend the next ten years of your life doing this deal and getting incredibly rewarded and that’s one of the reasons Jill and I chose this question. We get a ton of questions and this is a really good one. Jill DeWit: Yup, I love it. If you have a question or you wanna be on the show, reach out to either one of us on www.landinvestors.com. Jack Butala: Today’s topic, Land Investing: Passive Income or Not? This is the meat of the show. Jill DeWit: Why’d you pick this one Jack? Jack Butala: Because I think there’s a few concepts in business that titles get thrown around and it becomes somewhat of a wives’ tale so to speak. You know, I hear people talking about passive income and they’re throwing that term around it’s not what they’re talking about at all. Jack Butala: And I don’t like it, I don’t like passive … I think calling what we do passive income is, you know? It could be construed as that but I just … Go ahead Jill, there’s three types of income, right? Jill DeWit: What I was reading earlier, it was funny because this topic came up and then I said, “You know what I was just watching something that Grant Cardone was doing on Facebook and he was talking about three different types of income and what he said, ‘There’s earned, like W-2, portfolio, and then passive. '” and I’m like, “Oh, here comes this passive income term again.” I’m actually getting sick of it. Jack Butala: I’m getting sick of it too! Thank you, Jill! Jill DeWit: You know, ’cause let’s all be honest, you had to work to make it passive. So, is it really truly passive? Jack Butala: Well, the root of the three types of income is ’cause they’re all taxed differently. Jack Butala: Okay. I mean, so rental income is a classic example for passive income and that’s technically how it’s taxed. Jack Butala: If you’ve ever had a rental property are you hands off or not? No way man! You are never hands off on a rental property, I don’t care. You might have a manager in between, there’s some stuff that goes on, but you end hearing about it. Renting is not for me and Jill, we’ve tried it. Every time we get a rental property we end up selling it for three times what we paid and just getting out of it and moving on. Here’s what I think passive income would be. Buy a property, pave it, make it into a parking lot, find a parking lot operator, and do a triple net lease where the operator gives you a certain amount of money every month and then whatever he makes on top of that he keeps for himself. Hopefully it’s more than you and he stays there forever. That’s my definition of passive income and I think that the IRS would agree. Jack Butala: So what about us? You know we buy this land and we sell it on terms or we sell it for cash, is that passive income? I don’t think so. Jill DeWit: But based on … I was waiting for you to say. Jack Butala: I mean it could be, accounts have different … If it’s in a limited partnership, then it probably is. It might be, but I really would argue this is actual income. This is your day to day, I do this for a living, ordinary income. Accounts all over are turning off the radio. Jill DeWit: Okay, Jack. I have a question for you. This is inspirational. You know, I feel like people just want to walk around and say they have passive income when they’re not really sure what it is and they’re trying to achieve it. Why is this such a big hot topic right now? Do you have any idea? I’m a little curious. Jack Butala: No, I don’t. Well, I have an idea. If you just type passive income on Google, there’s people that are gonna get pulled up like Pat Flynn and Grant Cardone and all that stuff. And they talk about it because, I think, people don’t like their jobs. Jack Butala: If you start your search to replace your job, passive income is gonna smack you in the face twenty times. So, the idea of passive income, which I think is like making side income alright now let’s talk about that. But passive income implies to me like you’re passive and you just don’t want to work. Jill DeWit: You don’t do anything. Jack Butala: And I just don’t think that ever really … nothing good comes from doing nothing. Jill DeWit: That’s true. I agree. I just think the term, it bugs me, it’s overused, I don’t think people probably understand it, and it really isn’t passive in the end. Jack Butala: Here’s what people should want instead of passive income, scalable income. The best example of scalability is publishing. You write a book and then you promote it. You could sell it a thousand times or you could sell it seventeen million times and the work is the same. Jack Butala: That is scalable. What else is scalable? Software. Windows 10 was written once at an expense of X and how many copies do they sell a day of that thing? So, software is passive income. Software as a service is a fantastic business model where you just put up a website that people pay a subscription for or whatever, Jill and I have tons of those. Education in general is basically scalable income, so let’s think about an online school of any kind, like a high school. You have a teacher teaching it and it’s all self-taught. There’s no bricks and mortar school. Thirty people might be in the class, three million people might be in the class it’s very scalable. Jill DeWit: Well, it’s the same curriculum every semester so you just keep repeating. You don’t have to rewrite it every time. Jill DeWit: Algebra’s still algebra. Jack Butala: That’s right. I mean you might have to hire a couple more teachers or teaching assistants, if you get tons of people in any given class, to give them the attention they need and to keep your accreditation stuff. So, passive income’s not the buzzword, scalability is and if you ever watch Shark Tank that’s all those guys talk about. Jill DeWit: It’s true. You know what’s funny? Think about that one. They never use this word, they don’t throw this term around, that’s not their thing. Never. Jack Butala: You’re right, they never do that on the show. Those guys are billionaires. Jill DeWit: Mm-hmm (affirmative)- They work! They’re out there finding deals and making deals and getting stuff done. Jack Butala: I’d bet they work harder than we do. Jill DeWit: I’m sure of it. Jack Butala: I don’t think that’s possible. Yeah, maybe with you. Jill DeWit: See that guy out there? Yeah, right there the ice cream truck. He works harder than me. Jack Butala: I don’t know if that’s something you want to brag about. Jack Butala: Here’s what you want to avoid, and we’re gonna lose listeners over this. Jack Butala: A plumber, a doctor, and lawyer all get paid the same. They get paid for what I call fee for service and there’s a cap on how much money they can make. A lawyer can only bill, technically, eight to ten to twelve hours. However many hours they work in a day, and it’s at capacity. A restaurant can only make, if it doesn’t have a drive-thru, the number of seats in that turnover. You can calculate it. You don’t want to get into businesses like that, ever. Jill DeWit: Where you have a cap. Jack Butala: Yeah, where there’s just a natural cap on it, that’s right. A doctor can only do so many surgeries or see so many patients a day. So, those type of businesses are tough and a plumber is the same thing. Can you, as a plumber, hire a bunch of plumbers under you and manage them? Yeah, but that’s not scalable, that’s repeatable. That’s what McDonald’s is, repeatable. It’s not scaling, they don’t scale anything, McDonald’s the restaurant. True scalability is fantastic. What about QVC? You manufacture a mop, you go on TV, and you sell 3000 of them. Is that scalable. Jill DeWit: I don’t know, I’m looking to you. Jack Butala: Because you have a cost to get sold. Now, it’s a little bit scalable and cheaper the more you make and all of that, but that’s gonna end. The party’s be over with that pretty quickly. Jill DeWit: I like where you’re going with this. Jack Butala: I think we should do a whole show with The Jack and Jill Show. Jill DeWit: This is good. Oh, wow! Jack Butala: Because we but companies, Jill, and we just don’t ever talk about it. And we start companies all the time. There’s a lot a people out there that need some direction on this. It’s fun to talk about too, you know? Jill DeWit: Yes, I agree. Jack Butala: I think we should do a show called The Jack and Jill Show and we should talk about all kinds of stuff, land included. We should talk about land, land is very profitable. Jill DeWit: Right. But we could talk about all of the other things that we’re doing. That’s good. 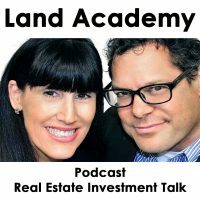 Jack Butala: So, is land investing passive income? I don’t know, ask your accountant. Is it scalable? No. You’re buying a piece of land and you’re selling it over and over and over. Now, you could approach scalability, but technically I don’t think it would be if you’re a term seller. We have lots of members who but a piece of property for $5000 they sell it for $25,000 with $500 down and $100 a month and they have hoards of money coming in every month. Jack Butala: That probably, in the eyes of the IRS, is scalable. Jill and I are primarily “buy it for cash sell it for cash” kind of people on these deals. We get in and we get out, because we don’t want to deal with the long term. It’s just a personal preference, we don’t. Jill DeWit: No ways right or wrong, I think they’re just different. Jack Butala: That’s right and the truth is we’ve found more efficient, better ways to make money than selling land on terms. For cash, it’s still the greatest thing ever. Jill DeWit: I love it! Let’s leave that for the next show. Jack Butala: Oh, good, okay. Jill DeWit: That’s pretty deep, Jack. I like that. Jack Butala: I love buying and selling companies and starting new companies in software and publishing it just, you know? I don’t want to sound altruistic, but not only are we doing it for the money I mean every week, you see the emails. Jack Butala: How many refunds have we done, for Land Academy, specifically. Jill DeWit: I could count them on one hand. Jack Butala: Yeah, that’s what I mean. And how many have we sold? Jill DeWit: It’s just usually people that their like, “It’s the wrong time in my life.” after they get into it. They’re just like, “I just can’t do it with the time I need to.” but I understand. Jack Butala: I have heard anyone say, “The information that you guys have sold me is not valuable.” I’ve never heard anyone say, “It’s really just scratching the surface, it’s not detailed enough.” Have you? Any you’ve seen? Jill DeWit: That’s for sure. No, that’s the opposite. No. Nope, nope, it’s good.